* A CONSTRUCTIVE NEW ZEALAND ROLE FOR PEACE ON THE KOREAN PENINSULA. * Korea at the crossroads: Peace or confrontation? THE FIRST STEP IN REUNIFICATION – a peace settlement agreement. Do North Koreans really think Kim Jong Il bowled a perfect 300 his first time out? Birds without borders: Bird watching in North Korea 27 May 2018. Half Hour TVNZ Documentary 27 May 2018. 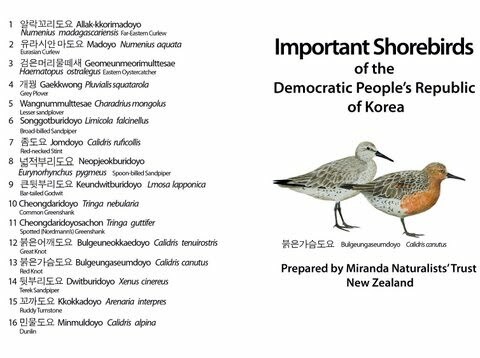 In April 2014 a team comprising two persons from the Pukorokoro Miranda Shorebirds Centre and two from the NZ Department of Conservation (DOC) visited Pyongyang and held discussions with the Natural Conservation Union of the DPRK (NCUK). The discussions led to agreement that a five year joint programme studying migratory birds on the DPRK shoreline will be undertaken. The NZ delegation and NCUK officials. In November 2007, the then New Zealand Minister of Foreign Affairs Winston Peters, visited Pyongyang. Among the topics he discussed were migratory birds, their plummeting populations, and the possibility of a team of ornithologists from NZ visiting the DPRK to undertake field survey research work. Facilitated by the NZ-DPRK Society, further discussions and planning took place during 2008. 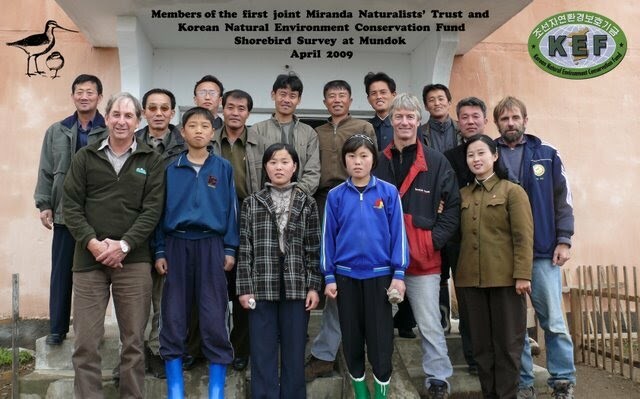 Agreement was reached that a team from the Miranda Naturalist Trust would visit in April 2009 to undertake a field survey of migratory birds alongside DPRK scientists. At low tide in the Firth of Thames, around 8,500 ha of exposed shell banks, mudflats and areas of mangrove provide extensive feeding opportunities for some 74 different species of waders and waterfowl. The average number of waders present in the area over the year is 25,000 while the total number present may peak at as many as 40,000 migratory birds during the summer months. One of these migratory species is the Red Knot (Calidris canutus), the numbers of which have been dropping alarmingly over the past decade. The Miranda Trust, along with members of the Flyway Network in other countries, have been building up information to try and find out why. They know when and where the birds leave from in NZ and where the birds migrate to in Siberia. But they do not know where they feed en-route. They have not been observed in South Korea or Japan. 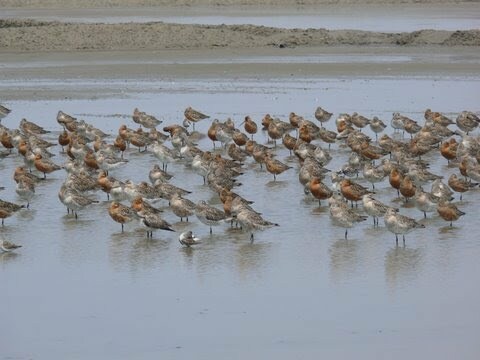 Find out whether Red Knots feed on North Korean mudflats during their annual migration from NZ to Siberia. Establish contact with North Korean ornithologists and assist them to open up communications and exchange of information with the wider Flyways Network. The team of three, led by Mr. David Lawrie, Chairman of the Miranda Naturalist Trust, spent the last two weeks of April 2009 on a trip to DPRK. The trip was undertaken with advice and assistance from the New Zealand Ministry of Foreign Affairs and Trade and funding from the NZ Department of Conservation and Ministry of Lotteries. In Pyongyang all arrangements were ably facilitated by Mrs. Ji Yon Ok, Secretary General, Korea-New Zealand Friendship Society. Travel and other logistical support was provided by the Korean Natural Environment and Conservation Fund. In the field the team was assisted by the Vice-director of Mundok County Land and Environment department and worked closely with the manager and staff of the Mundok Migratory Birds Wetland Reserve. 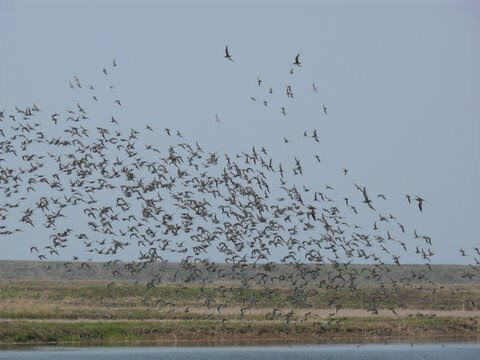 Some 30km of coast in the Mundok Migratory Birds Wetland Reserve was selected to undertake the field survey because it was known to hold some shorebirds even though available data was very limited. It is an important place in winter for ducks, geese and swans. The Reserve is situated on the southern side of the Chong Chon River estuary approximately 39° 30’ N – 125° 22’ E on the West Sea (Yellow Sea) and is some 80km north of Pyongyang. During spring tides, the mudflat at Mundok are covered at high tide forcing shorebirds to roost inland for several hours over high water. Therefore counts are best planned to coincide with the high spring tides. The NZ team together with their local counterparts tried to be in place at least two hours before high tide and count birds as they arrived from the mudflats. Counts were carried out 26–29 April 2009 with Ryong Rim-ri counted twice on 27 and 29 April. During this time the team counted approximately 5,750 shorebirds of 22 species. Unfortunately no Red Knots were observed ! It is thought that the tidal flat sediment in the area may not contain the small bivalves favoured as food by the Red Knots. Bar-tailed Godwit. The sub-species baueri accounted for most of the Bar-tailed Godwit seen during the survey with much smaller numbers of the menzbieri sub-species present. This might change in May, as menzbieri are known to migrate northward slightly later. Therefore, this count represents more than 1% of the baueri population. Far-Eastern Curlew. The count on 26 and 27 April represents approximately 3% of the world population. Eurasian Curlew. The count on 26 and 27 April represents approximately 2% of the flyway population. Saunders’s Gull. 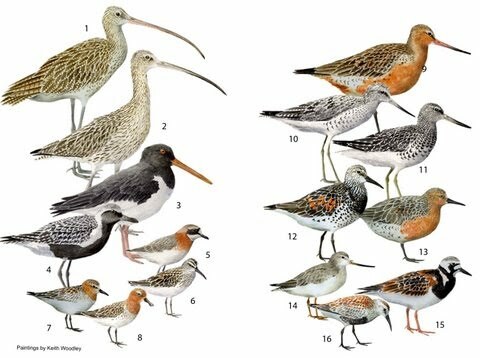 Although this species is not classed as a shorebird it is well worth noting that the 79 counted on 29 April is a significant number of this threatened species, which has a world population of around 4,500. Dunlin. Almost 1,300 at So Ho-ri and 200 at Ryong Rim-ri indicate that Mundok is a good site for this wide-ranging species. Great Knot. A bird that feeds mainly on small bivalves, therefore, the small number and the lack of Red Knots may indicate that their food source is not abundant in the soft deep mud at Mundok. Grey Plover . Fairly small numbers counted but they often migrate later so more can be expected during May. Kentish Plover. Very small numbers, mostly in pairs, which probably represents birds that will breed in the area. Lesser Sand Plover. This is another species which migrates later so larger numbers may be expected in May. Spotted Redshank. A small number and those seen were not in full breeding plumage so more may come through in May. They are not often found in large numbers but are widely distributed and also occur in rice paddies, therefore the number present may be higher that the count indicates. Terek Sandpiper. A significant count of 133 at Ryong Rim-ri, which included one bird banded at Chongming Dao near Shanghai in China. Pacific Golden Plover. 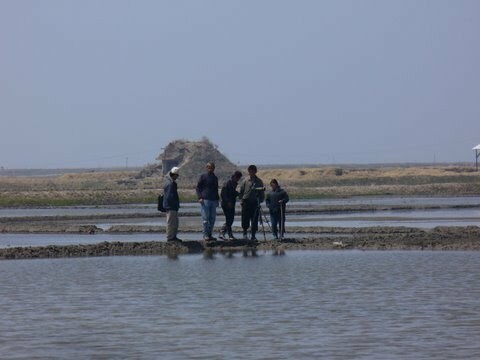 Although only one was seen on the mudflats, about 40 were seen in ploughed paddies 2km inland from Ryong Rim-ri (included in Ryong Rim-ri total). This species can be quite elusive and would be easily overlooked if they were feeding in ploughed rice paddies. Approximately 51 individual banded birds were identified, although identification of complete colour combinations on some birds were not possible. These included birds which had been banded at various sites in both Australia and New Zealand. At the conclusion of the field work, the Miranda Naturalist Trust signed an agreement with the Korean Natural Environment and Conservation Fund to ensure future cooperation. the two parties agree to cooperate on further shorebird surveys in DPRK and strengthen relationships with international organisations for nature conservation and environmental protection. It is hoped that a team from NZ can return again in 2010 to further survey the coast for migratory shorebirds in the hope of finding the elusive staging site of the Red Knot and other shorebirds passing through the area. The MNT has been undertaking similar survey work at Yalu Jiang in China just across the border from DPRK since 2004. Acknowedgement: Report of the First Shorebird Survey of the Mundok Migratory Birds Wetland Reserve by the Miranda Naturalists' Trust and Korean Natural Environment Conservation Fund 26 – 29 April 2009. 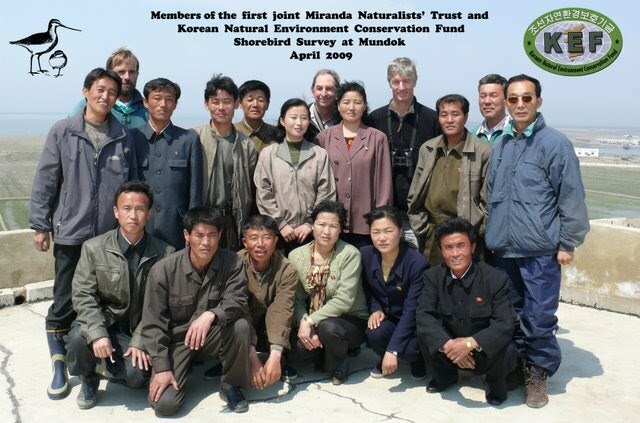 A Miranda Naturalists' Trust -Korean Natural Environment Conservation Fund Project. Adrian Riegen , David Lawrie, Tony Habraken, Ri Thae Gun, Chon Jong Hyok.